British documentary photographer Martin Parr has been awarded the Outstanding Contribution to Photography title by the World Photography Organization. The title will be bestowed at the 2017 Sony World Photography Awards ceremony held in London on April 20. Sorrento, Italy. Copyright 2014 by Martin Parr. 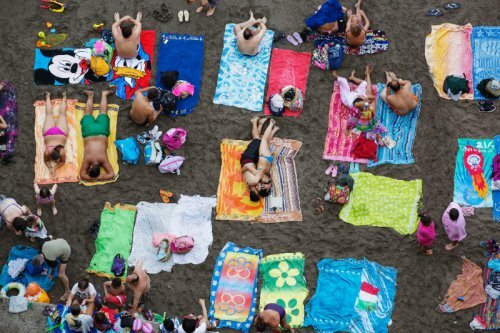 Scott Gray, World Photography Organization CEO, said, "Martin Parr's work has transcended all the usual boundaries of photography and shown that the medium is a hugely powerful means of communication. As an artist Parr has created a unique visual language that is deeply serious, but its inherent humour has ensured that his work has an almost global understanding. "Great integrity and commitment to the medium of photography is the common thread that links each of our previous Outstanding Contribution to Photography Award recipients. These are qualities that Martin Parr has consistently displayed throughout his career and why we are proud to present him this title in the 10th anniversary of the Sony World Photography Awards." Parr noted, "It is a great honour to receive the Outstanding Contribution to Photography title, especially knowing the illustrious previous recipients such as William Klein and William Eggleston. It is also very re-assuring to see the World Photography Organization and Sony's continuing support for all aspects of contemporary photography, through this exhibition and this season of awards." The World Photography Organization today announced British documentary photographer Martin Parr as the recipient of its Outstanding Contribution to Photography title. The photographer will collect his title at the 2017 Sony World Photography Awards ceremony held in London on Thursday 20 April. In a career spanning more than 40 years and often focussing on themes of leisure, consumption and communication, Martin Parr's unique and ambiguous vision of the world has led audiences worldwide to find drama in the every day. By recording in minute detail the world as he sees it in, Parr's frank reflection of national characteristics and international phenomena has pioneered a new tone in documentary photography. It is this dedication to the medium and pushing of boundaries that made Parr's selection for the award easy for the World Photography Organization, despite the photographer's recent assertion that "If I knew how to take a great photo, I would stop." Scott Gray, CEO, World Photography Organization comments: "Martin Parr's work has transcended all the usual boundaries of photography and shown that the medium is a hugely powerful means of communication. As an artist Parr has created a unique visual language that is deeply serious, but its inherent humour has ensured that his work has an almost global understanding. Upon being told of the award, Martin Parr commented: "It is a great honour to receive the Outstanding Contribution to Photography title, especially knowing the illustrious previous recipients such as William Klein and William Eggleston. It is also very re-assuring to see the World Photography Organization and Sony's continuing support for all aspects of contemporary photography, through this exhibition and this season of awards." Born in 1952 in Epsom, Surrey, Martin Parr was inspired to take up photography as a teenager by his grandfather. Black and white photography characterised his early work and his move to the strong use of color photography in the 1980s, for which he has become synonymous, was prompted by photographers such as Stephan Shore, William Eggleston, Peter Fraser and Joel Meyerowitz. Parr has been a member of Magnum Photos since 1988 and was voted President of Magnum Photos International in 2014. The rooms will begin with a selection of rarely seen images from Parr's Abandoned Morris Minors series, shot in the West Coast of Ireland between 1980 and 1983. Original posters for the first exhibition of this work will also be on show. In will be contrasted with some of Parr's best loved images that each focus on global tourism. Talking about the selection of the work, curator Zelda Cheatle comments: "Most people recognise the Martin Parr 'style' of daylight flash, his ability particularly to capture the English at work, at rest and at play -- the humdrum and everyday -- and transfigure this into a mixture of wry observation and social irony. As I have known Martin Parr's work from early days, I was keen to show his (mostly unknown) gentle black and white pictures from the West Coast of Ireland. These photographs of abandoned Morris Minors show a real affection for the landscape of Ireland. There is no mockery here -- definitely some characteristic humour and (dare I say this about Martin) -- some poetry too. Martin's tackling the giant industry of tourism seemed a perfect complement to this early work. Tourism is a necessary evil -- and maintains many countries' economies -- but it also threatens to devour itself Orobourus -style. These two sides of Parr, which I rate highly, are not often shown together -- these aspects of his work -- these aspects of his work may not be so well known, but should be acknowledged more." The Sony World Photography Awards is the world's largest photography competition. The shortlist for the 2017 awards will be announced Feb. 28.